Purity is rare in today’s world. Global warming, genetic modification, and harmful pesticides are sprayed on our food crops. Excess noise, dirty air, suspect water and over-planted, nutrient-starved soils contaminate our environment. Over thirty-five years ago, the founder of Trout Lake Farm was blessed to discover an uncontaminated microclimate perfect for growing a variety of organic medicinal herbs. He found a pristine glacial water source from the White Salmon River that wound its way down from the twelve thousand foot snow covered cone of Mt. Adams to the north. Here was a place relatively undisturbed by the messy, noisy, polluted world.A place that still has a little general store where friends gather, a school that teaches kindergarten through twelfth grade and where, even if you’re a visitor, it won’t take long to learn everyone’s names while having a piece of homemade huckleberry pie at the local cafe. This story of place and purity has inspired the people at Trout Lake Farm for more than forty years and has given us an intense passion for quality. 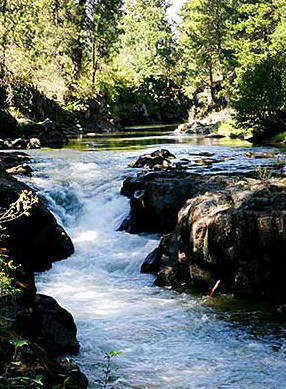 It has inspired us to work in close cooperation with the earth’s natural processes. And, due to the insight of the company’s original owner, almost a quarter of our farm is protected farmland in perpetuity due to an easement from the Columbia River Land Trust. 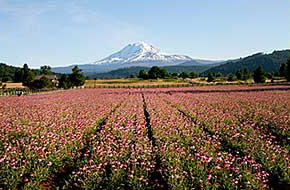 Today Trout Lake Farm West (Trout Lake, WA) is a bustling, skillfully managed state of the art organic farm. Our facilities include drying, root washing, milling and warehousing.We have over 300 acres in cultivation and approximately 60 full time and seasonal employees during the peak of the season. Two dozen of our seasonal workers are employees of Nutrilite’s farm in Jalisco, Mexico; Rancho El Petacal. They come to work here under the U.S. Department of Labor’s H2A program. Our West Farm is also administrative headquarters where Sales, Accounting and General Management are located. We produce, process and ship over 670,000 lbs. of 100% certified organic botanicals annually from this location. Click here to see a list of our botanical products. When you come to our Columbia River Basin Community in Ephrata, Washington, you immediately sense the majesty of the vast open space and the endless sky. This is a grand place where hard working men and women have carved farmland out of the desert with long days and endless hours on big machines. Legend has it that a worker on the rail line found that the orchards and the landscape were similar to the Holy Land and christened the area “Ephrata”- (E-fra-ta) Hebrew for “fruitful” and an older name for Bethlehem. The land feels ancient, wise and powerful. It is no surprise since its origins lay in the mighty upheavals of prehistoric glaciers and epic floods. Grand Coulee Dam, one of America’s great New Deal engineering masterpieces, built from 1933 to 1942, transformed the Basin and its communities.In 1942, the U.S. Army Air Corps built a large bomber-training base in Ephrata. (Our big warehouse and milling operation in Ephrata is located in one of the old hangars.) After the war in 1951, the Columbia Basin Project was created, delivering water from Grand Coulee Dam to over 600,000 acres of fertile, but otherwise dry, farmland. Today, at our Farm in Ephrata you can see large scale organic herb farming at its finest. We chose this area in Grant County, in the heart of the Columbia Basin Irrigation Project, because its climate mirrors the primary herb growing areas of Eastern Europe. The long hot growing season, low humidity, and cold winters, makes this climate ideal for a large diversity of organic herb crops. The rich sandy loam soil is a lasting gift from the pre-historic Missoula ice age floods. Our clean water originates in the snow covered Mountains of South Western Canada. 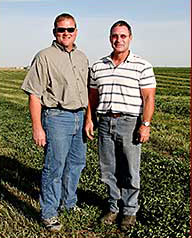 At Trout Lake Farm East we have an intense passion for efficiency, effectiveness and hard work. We do things in a big way while still maintaining the highest quality standards. 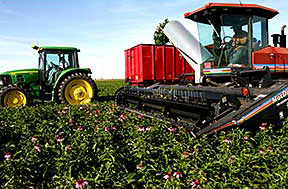 We have adapted our extensive innovative farming experience to the unique requirements of organic production. At the East farm and mill, we employ over 90 workers at the peak of our season and cultivate approximately 630 acres. We produce, process and ship approximately 1.9 million pounds of 100% certified organic botanicals per year. Click here to see a list of our botanical products. 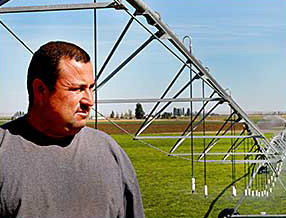 Nutrilite’s Agricultural Research Farm is located at Trout Lake Farm East. Farm researchers work to improve existing NUTRILITE® products as well as identify nutrients and active ingredients for new products and the development of organic farming practices. Community Outreach: Trout Lake Farm is committed to contributing to the communities in which we operate.TLF is a large supporter of local schools. We donate to the lunch scholarship program which provides free meals to students in need. Produce from our garden is donated to the Farm to School program. As our day of service, under the Amway One by One Campaign for Children, we purchase, cook, and serve a delicious meal for the entire school. We also contribute to local High School Graduate Scholarship Funds, the Youth Athletic Association, 4-H Youth programs, and local Food Banks.